Confederation of Indian Industry (CII) has been playing a pioneering role in developing the Construction Equipment Industry in India through the biennial event Excon - South Asia's largest trade fair on Construction Equipment & Construction Technology. Excon - Sri Lanka exhibition was the region's largest trade fair on Construction Equipments & Construction Technology. Excon - Sri Lanka was held at Bandaranaike Memorial International Conference Hall (BMICH) from 30 Oct to 01 Nov 2009. Manufacturers of Construction Equipments & related components will attract the Contractors, Defence, Leasing & Finance Companies, Machinery & Equipment Dealers. Concrete Show South America is an international meeting point of business and technology, exclusive for concrete supply chain and its users. Concrete Show brings together more than 20 different segments of the concrete production chain and as a shop window, it reflects the growth of the economy, pushing the sector forward and is strongly representative of Brazil. Concrete Show India is the most eagerly anticipated event of the year within the concrete industy. The show is a business to business networking event tailored to the interest and business needs of the concrete professional. 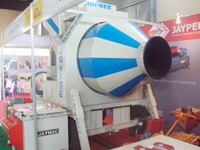 Concrete Show India, which takes place from 23 - 25 February 2012 at the Bandra Kurla Complex in Mumbai, will bring together buyers and sellers within the concrete industry to experience and interact with the full range of concrete products, share best practice and enhance industry knowledge. 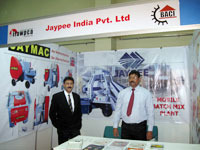 Jaypee participated in BACE Expo 2011 11th-13th November, It was an extraordinary event dedicated to the sector of building and construction. The 8th International Building, Architecture, Construction & Engineering Technology Trade Show will be attended by a large number of national and international products and technology suppliers who are inquisitive to learn about the prospect of construction industry in the Eastern India. 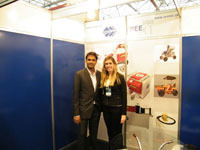 EXCON 2011 was supposed to be the 3rd Largest Construction Equipment Exhibition in Asia and its South Asia's largest event for Construction Equipment .Approximately 330 national and international exhibitors participated. 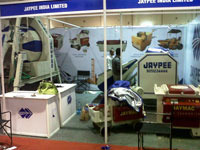 Jaypee India had a stall space of 117sqmts. For 4 days, Machinery Mart Guwahati was hosted by Confederation of Indian Industry and is the one of the largest trade event on innovative machinery, technologies and related services. 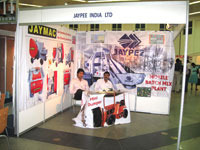 Jaypee to exhibit its brand new machines at BAUMA 2013 Africa this September ,at Gallagher Convention Centre, Midrand, Johannesburg South Africa. Visit us at Hall-5,Stall-487 from 18-21 September 2013. 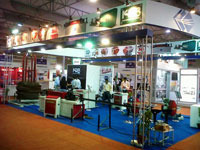 IFAWPCA ,BACI International exhibition 2009. Bangladesh, through BACI, organized the IFAWPCA Convention at Dhaka in March,2009. The successful hosting of such a high-profile international convention in Dhaka brought further recognition to Bangladesh as a business friendly investment destination, especially for the infrastructure and construction projects. 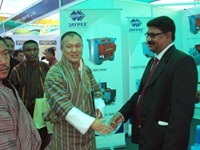 Reputed contractors and construction industry professionals from all across Asia visited and participated. 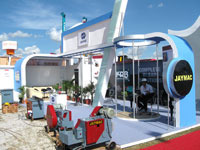 Following the overwhelming success of First Machinery Mart, Confederation of Indian Industry (CII) organized the second edition of Machinery Mart in Guwahati, Assam from 24-27 February 2012 with its prime focus on the Infrastructure and Construction sector. More than 22,000 visitors from 69 countries attended the first edition of the International Trade Fair for Construction Machinery, Building Material Machines, Mining Machines and Construction Vehicles. The event is a joint venture between Messe München International (MMI) and the Association of Equipment Manufacturers (AEM). 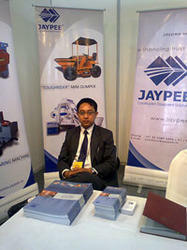 Jaypee India Ltd successfully participated in the show, and showcased the best machines with the latest technologies. And it received amazing response from the visitors. 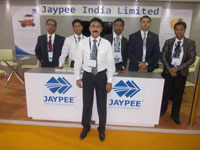 GM Sales Jaypee India Ltd Mr. Ray says the exhibition proved to be excellent for Jaypee. 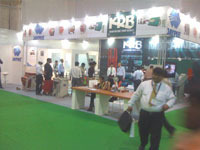 And such exhibitions are very important for our business. The Bhutan Chamber of Commerce and Industry (BCCI organized a construction expo from June 2nd till June 6th at Changlingmithang in Thimphu. A five-day expo provided platform to foster new business relationships, a workshop to explore innovation and a venue to experience new tools and equipments.